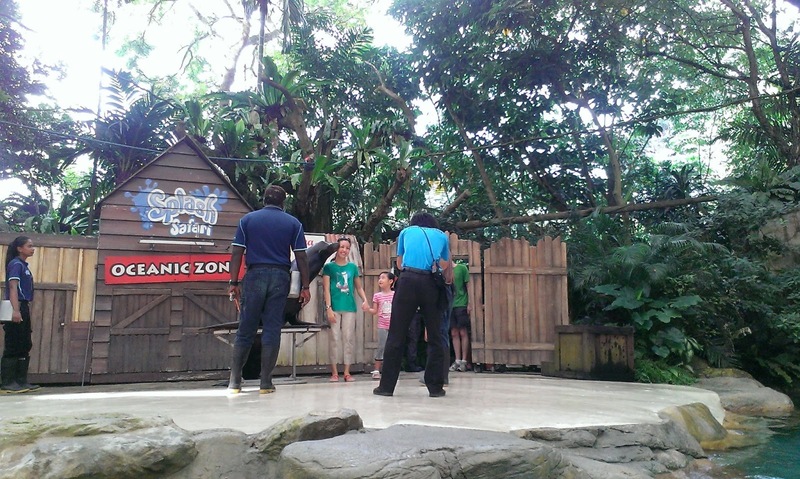 With Kids, We Go...: Singapore Zoological Gardens: "It's Showtime!" 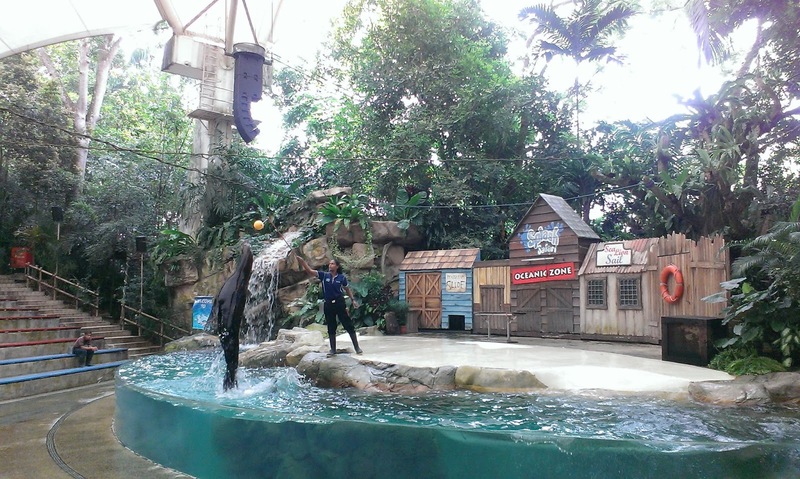 Singapore Zoological Gardens: "It's Showtime!" A number of things fell nicely together last week: Daddy secured a corporate pass for four tickets to the zoo and managed to get his leave approved, the hazy weather in Singapore cleared up, and the kids are healthy! What are we waiting for? Let's go! It's been some time since our last trip there, and we decided to deviate from our usual itinerary by spending more time at the animal shows and feedings than the animals exhibits themselves. Of course, one of our objectives will be to check out Inuka the polar bear's new enclosure and visit some of his friends at the Frozen Tundra. We set off in time to make it just after the opening hour. The girls were hungry and we picked up a couple of traditional butter-sugar toasts from Ah Meng Kopi at the entrace to bring along. We were quickly on our way to catch a family favourite, the Asian Elephants doing their bathing and feeding routine at 915am. 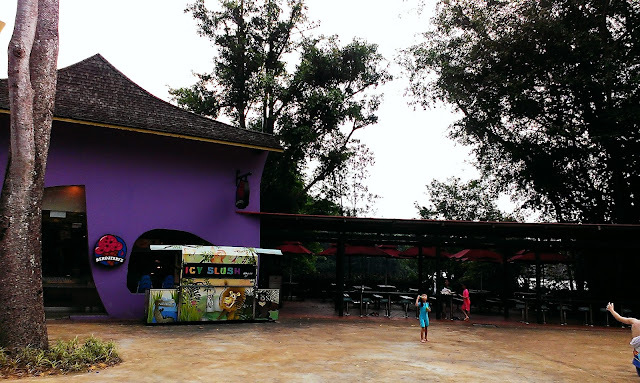 We've enjoyed this whenever we come to the zoo and still enjoy it. 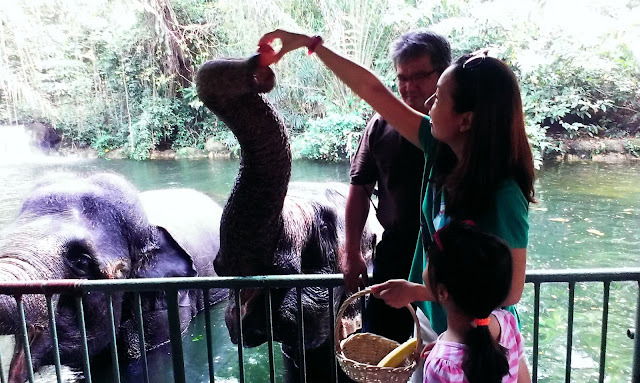 During the feeding segment, A. chickened out of feeding the tender giant and Mummy had to do it on her behalf. I guess the sheer size of these animals can be very intimidating, and it's been a while since she last encountered them. K. enjoyed the show but kept her distance as usual. She's got a slightly more cautious demeanour compared to A.. 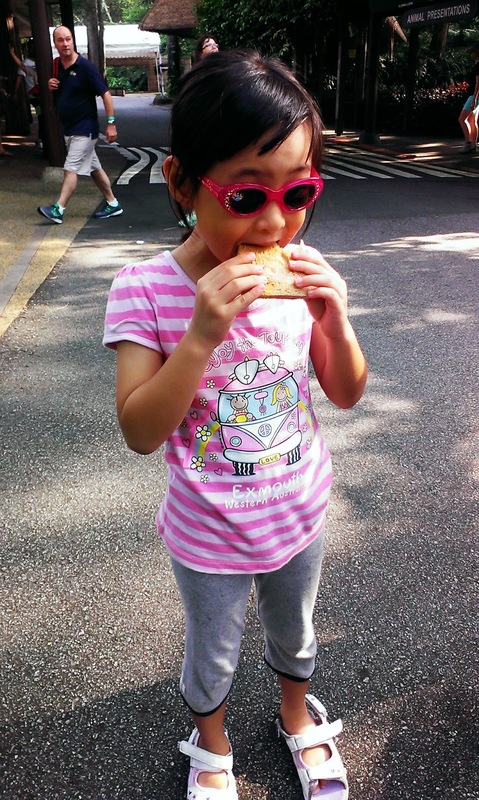 The giraffe exhibit was closed, otherwise, it would have been another nice feeding experience which we usually enjoy. 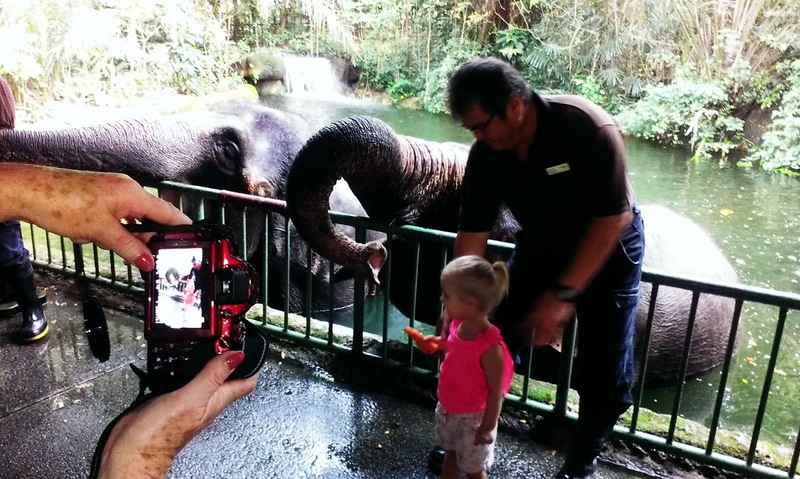 She's one brave (and adorable) little toddler. After the elephant feeding, we had twenty minutes before the next show: polar bear feeding! 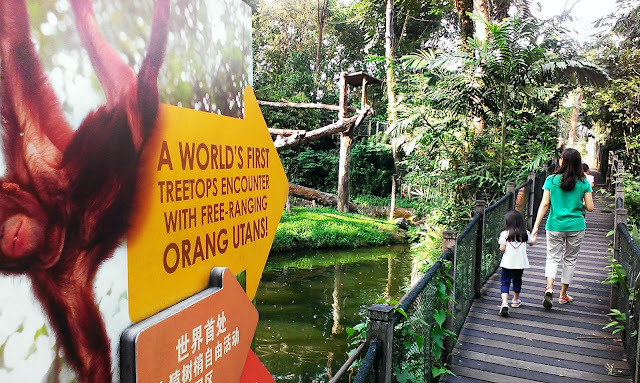 We decided to check out the free ranging Orang-utans, exploring the world's first 'Tree-Top Encounter with Free Ranging Orang-utans'. The funny thing is that when we reached the top of the boardwalk, there was not even one Orang-utan to 'encounter'. In fact, they were all far below us... on the ground! 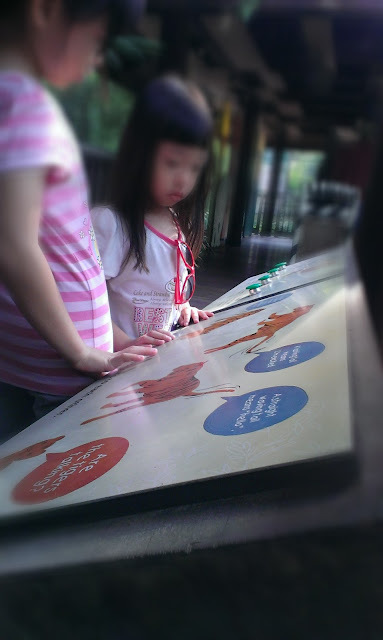 There were some informative poster boards on the railings and we spent a short time there learning about these magnificent apes. "Hey, isn't this supposed to be a TREETOP encounter? What are you doing down there?" Along the way to the Frozen Tundra, we stop by to check out the Pygmy hippos and White Tigers. 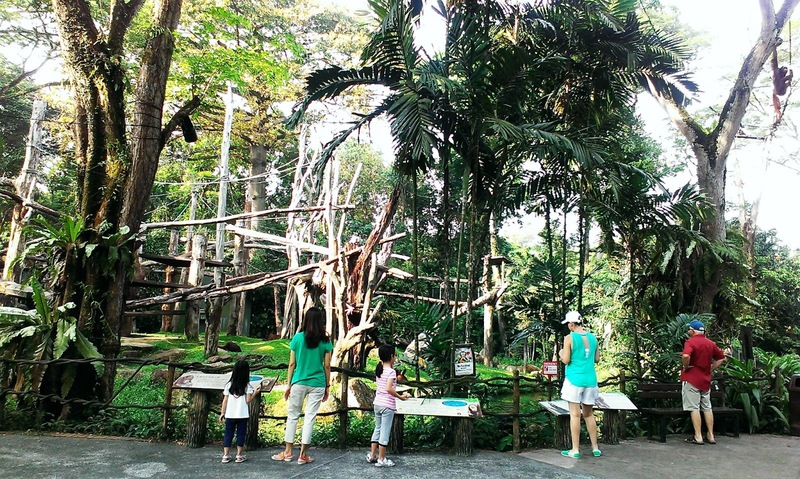 At the tiger enclosure, the kids asked many questions about the interesting exhibits there. 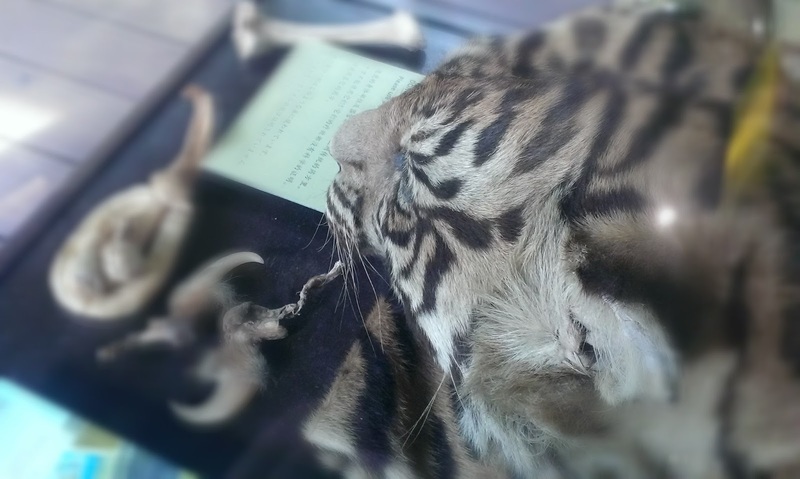 There were artifacts and a video depicting the plight of tigers at the hands of poachers, and another informative and interactive one on how tigers communicate with one another using their roars and tails. It was really funny because we started 'communicating with one another' using our hands as tails. 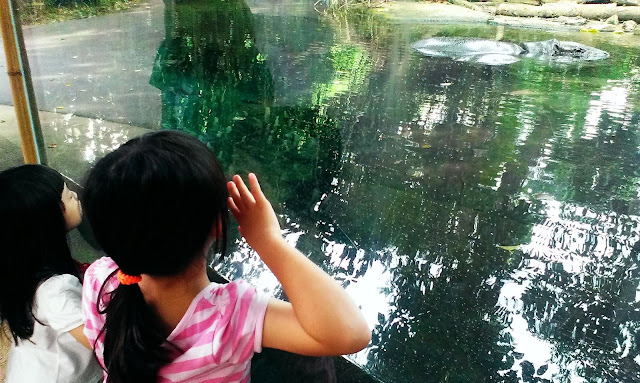 Peering through the reflections in the glass window to spot the hippo! Press the buttons to hear the growls and read what it means. 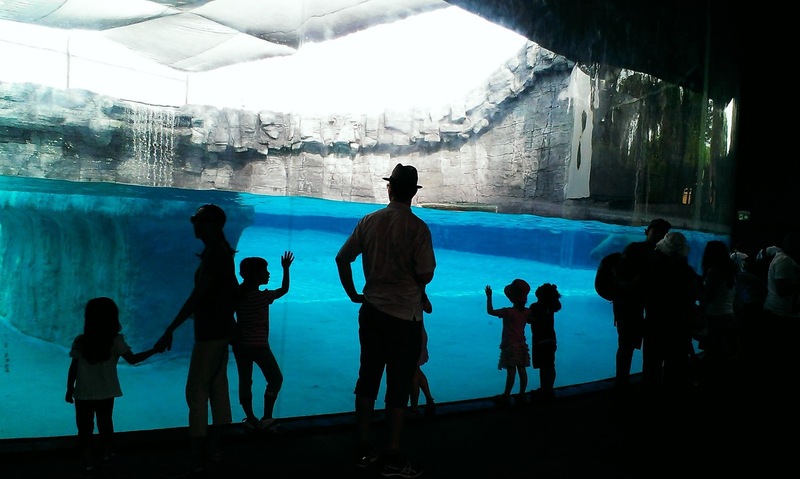 We reached the polar bear feeding slightly late and the show has started. The new enclosure boasts a wider and taller viewing gallery, and the polar bear named Inuka was active and about, snatching treats thrown into the water by its keeper. 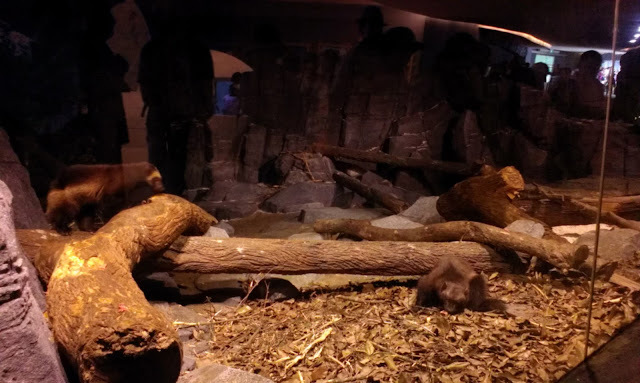 Interesting facts: the enclosure is kept at room temperature, but Inuka can retreat into an air-conditioned hideout whenever he wants to; Inuka weighed a mere 500 grams at birth, but nourished by its mother's milk, which is 90% fat, the tiny baby has grown into the beast it is now! Anyone one dare to bottle feed your baby polar bear milk? Watch out! 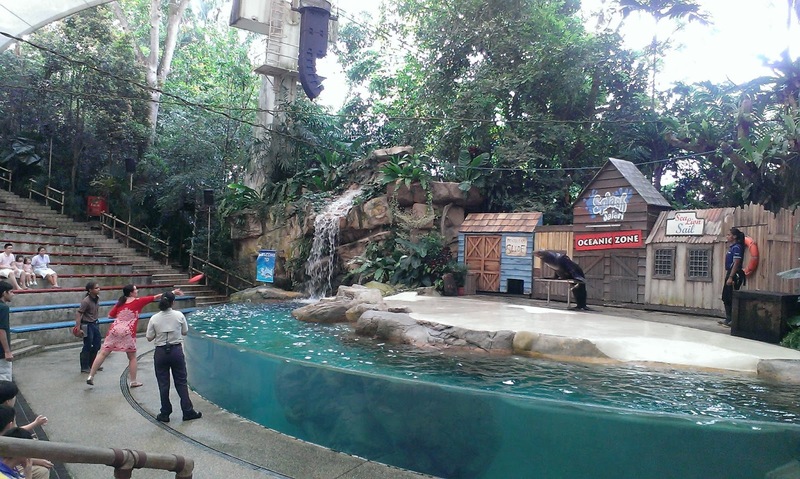 By the way, Inuka was proudly delivered here in the Singapore zoo! 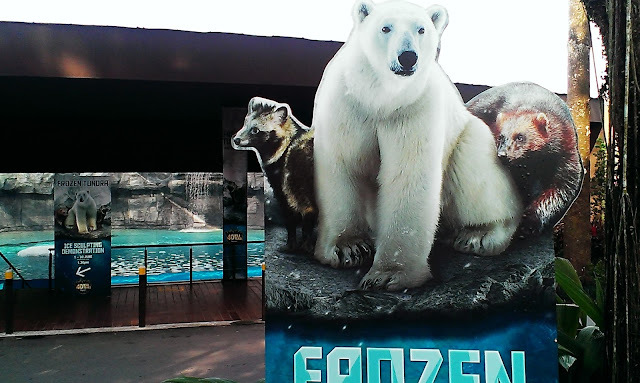 Inuka was showing off! He can do the doggy paddle, dive, backstroke too! Great vision under water to spot tiny bits of meat thrown into the pool. Here he dives to get his treat. 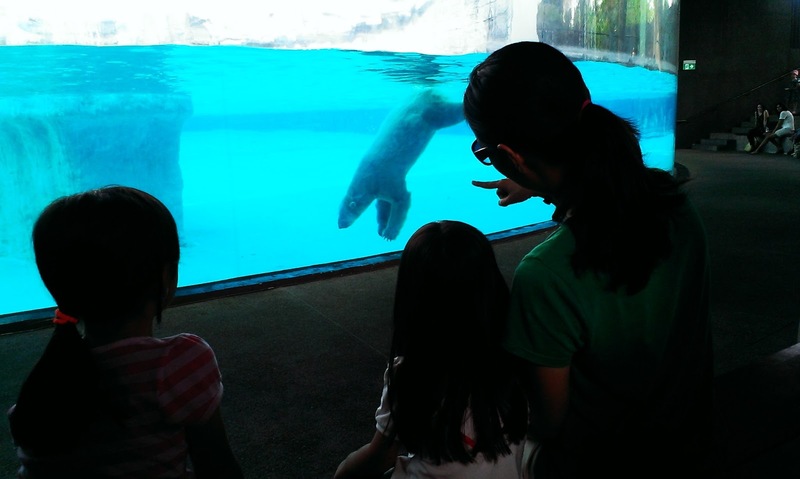 If the trainer is too slow in his throwing of feed, our dear Inuka would clap his paws to get his trainer's attention. Cute! 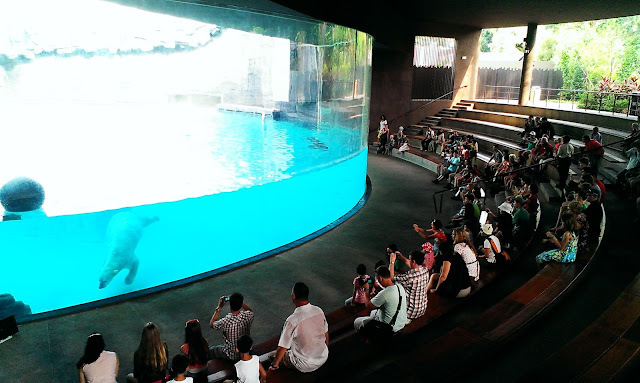 Everyone waits at the glass after the show hoping that Inuka will swim by. 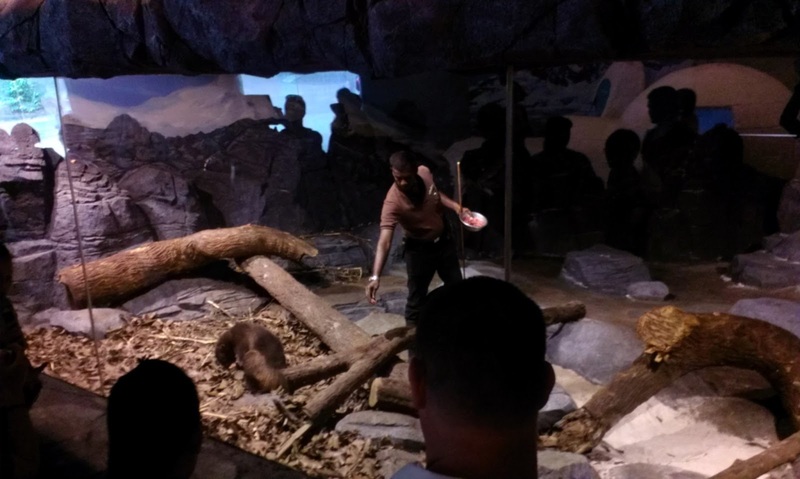 After the feeding, the guide will take you through Inuka's neighbourhood to see the Racoon Dogs, Pom and Poko, and the Wolverines, Ivana and Boris. 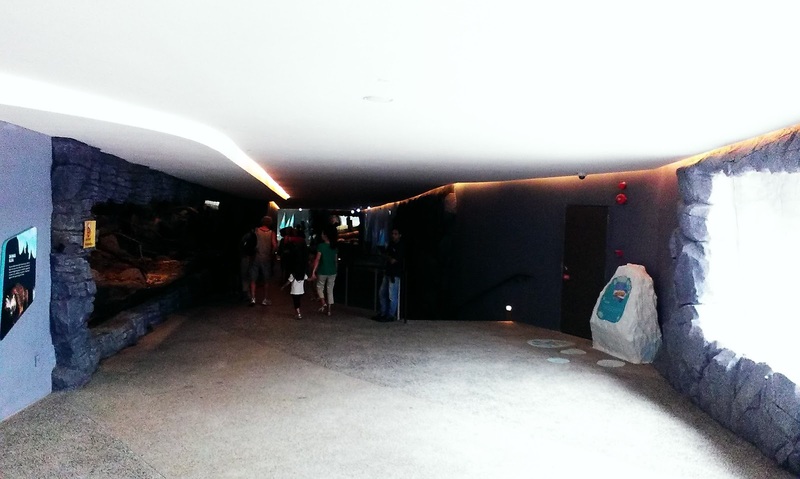 Enter into the frozen underworld! The Racoon Dogs look adorable... and they really do resemble racoons. 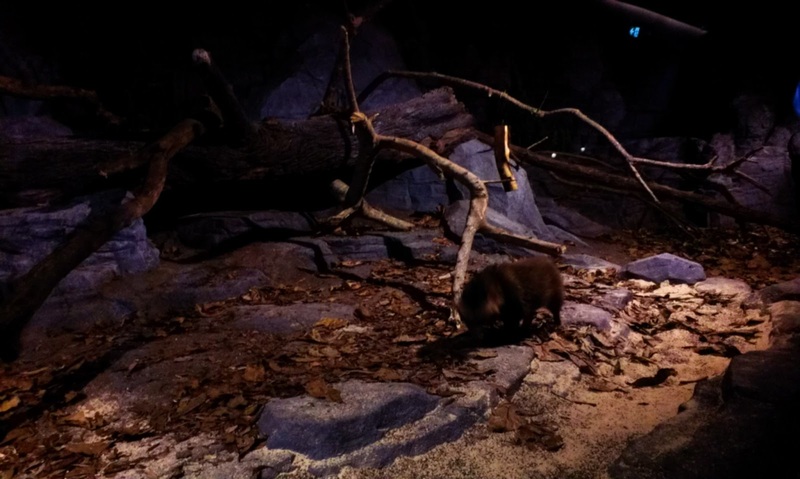 It's wolverine feeding time! These fellas are fierce. One of them is so ferocious it can scare a bear away to steal its' kill. They eat all of their prey, with jaws strong enough to chew through bone and marrow... when they are done, there are no bones left. This is not X-men guys, this is sheer power! Boris and Ivana... based on their names, can you guess where they are from? 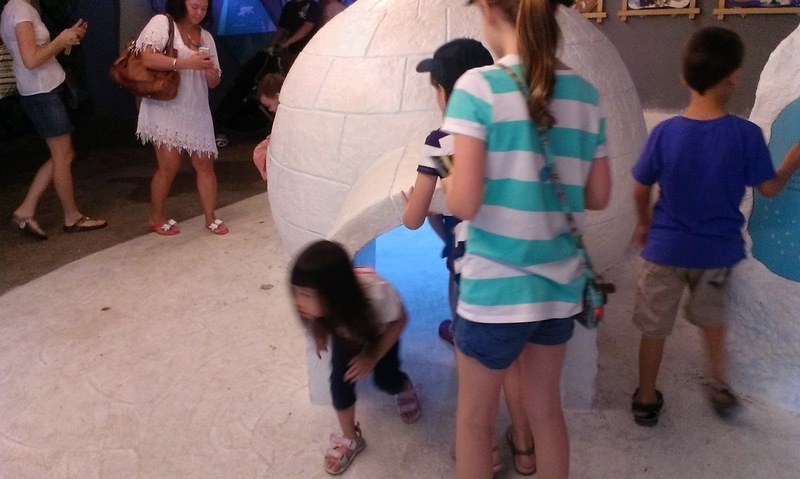 There's a mock igloo kids really enjoyed running in and out of. 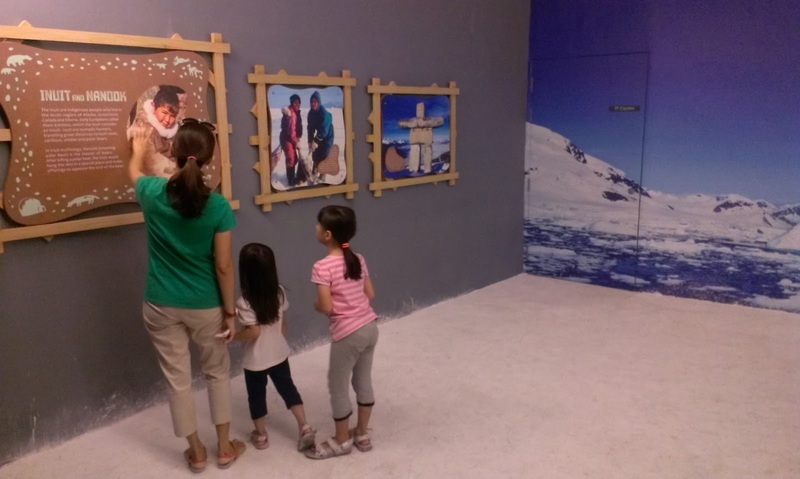 Time for school: the girls get an education on the people who live under these conditions, our beloved eskimos! Lots of informative posters here. Our next stop was the Splash Amphitheatre, for some slippery sea lion action! Coming on a weekday morning turned out to be a very good idea as there was hardly any crowd, making it easy for us to find a nice spot in front. 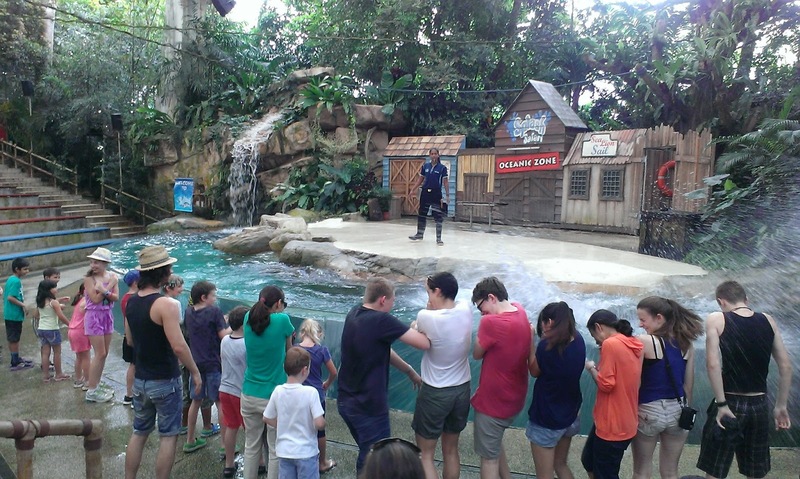 It was nice to see the splashing action up close. Many empty seats. Perhaps because it was a weekday morning? 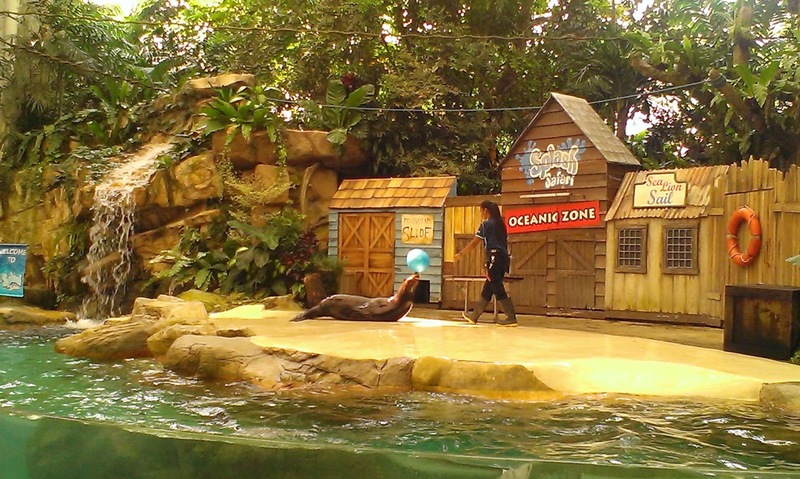 The sea lion jumps out of the water! A plus point of this show was the crowd participation. Here, a sporting guest throws a Frisbee toward the sea lion who catches it with ease in its mouth! 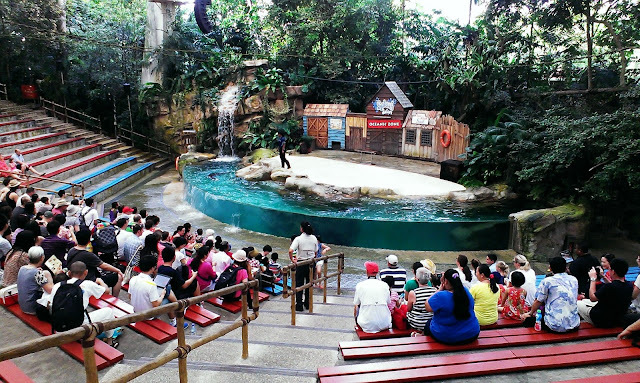 Part of the show allows visitors to get up close to the water and get wet! Oops, we did not bring an extra set of clothes for Mommy... it'll have to air-dry I guess. Getting a kiss from another 'man' might make Daddy jealous... just kidding! 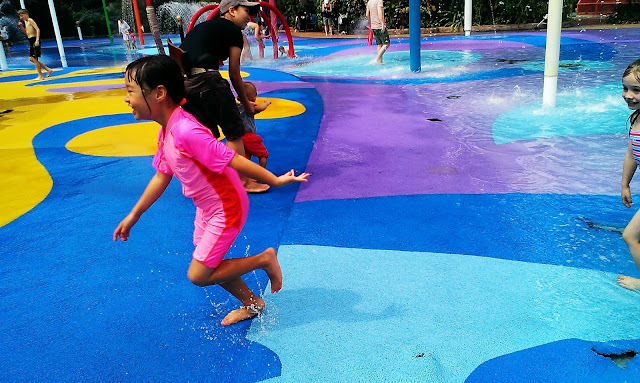 It was reaching mid-day and the kids were looking forward to water play at the Kidszone. Along the way, we chanced upon the Orang-utan feeding and gathered around to watch and listen to the keepers talk about the long time mascot of the zoo. 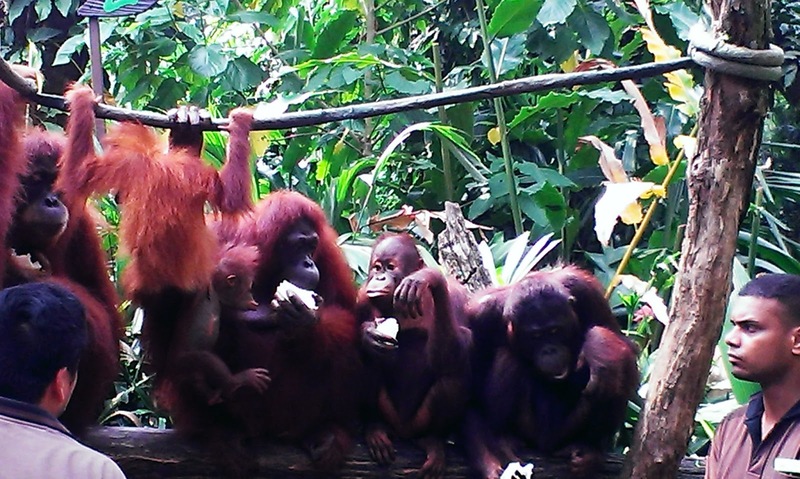 We noticed they were fed cabbages, which they seemed to chomp down very quickly. 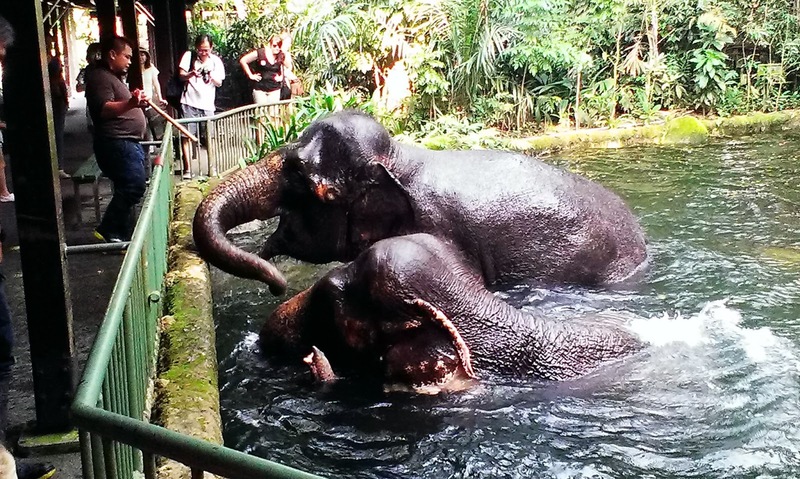 One of them ate a few whole cabbages just during the ten or so minutes we were there. The keeper commented about how strong the arms and hands of these creatures are, so much so that hanging and swinging from branch to branch appeared almost effortless. You wouldn't want one of these to arm wrestle you. Daddy was amazed at how a predominantly plant based diet developed such strength, and muscular arms that would put body builders to shame. The ladies gamefully took the opportunity for a photo after the presentation for keepsakes. Everyone wants to see the proud mascots of the Singapore zoo! Tourists enjoying a photograph with these magnificent creatures. 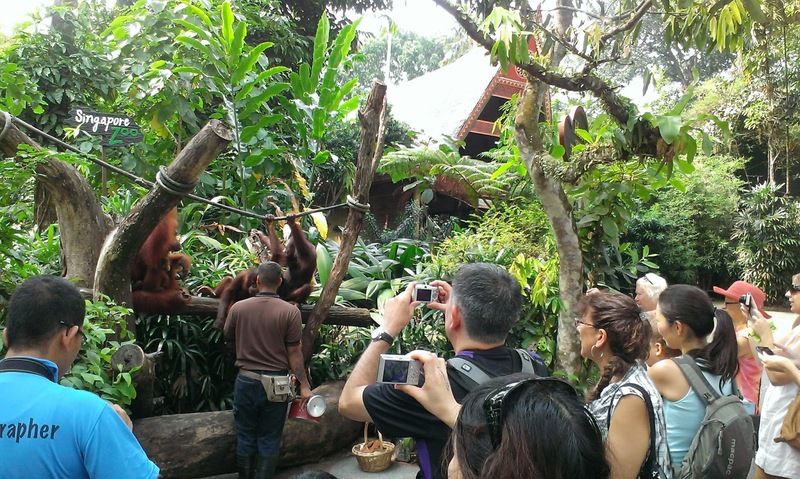 After the educational feeding and photo session with the orang-utans, it was approaching lunch time and the girls were looking forward all morning to their lunch and water-play at the Kidszone area. 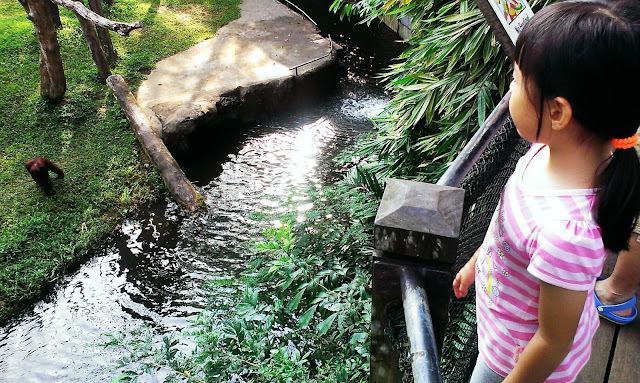 We took a short walk to the place hoping to catch the Animal Friends show at the amphitheatre there, but decided to slow the pace and give it a miss. 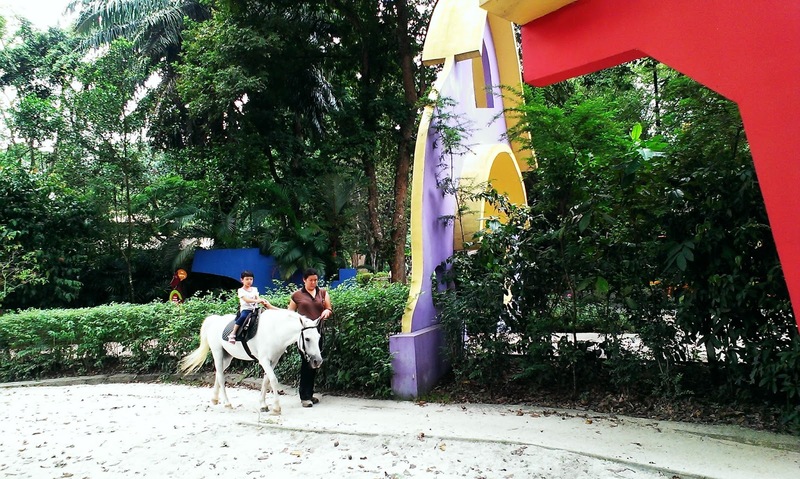 Instead, we stopped by the pony rides at entrance of the Kidszone. 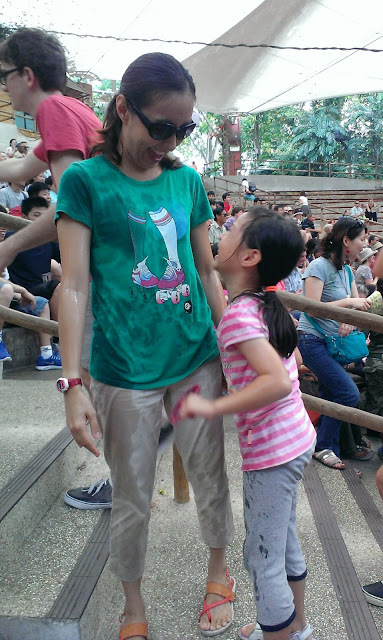 A. had been on the ride before, but it was going to be K.'s first time! 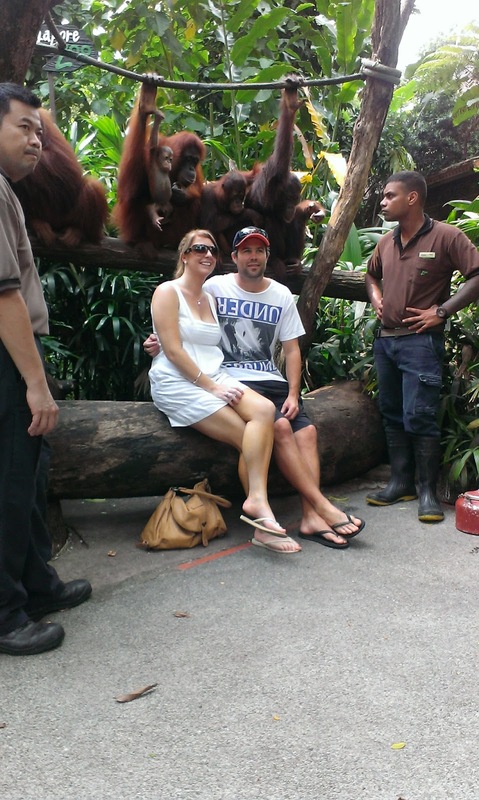 We were extrememly proud of her as she had decided to step out of her comfort zone and give it a go. You could tell from the expression on her face that she was rather apprehensive at first, but by the time the pony was making its return, she was swaying along with the leisure bouncing motions of the trot with a smile and a proud 'look at me' expression written on her face. 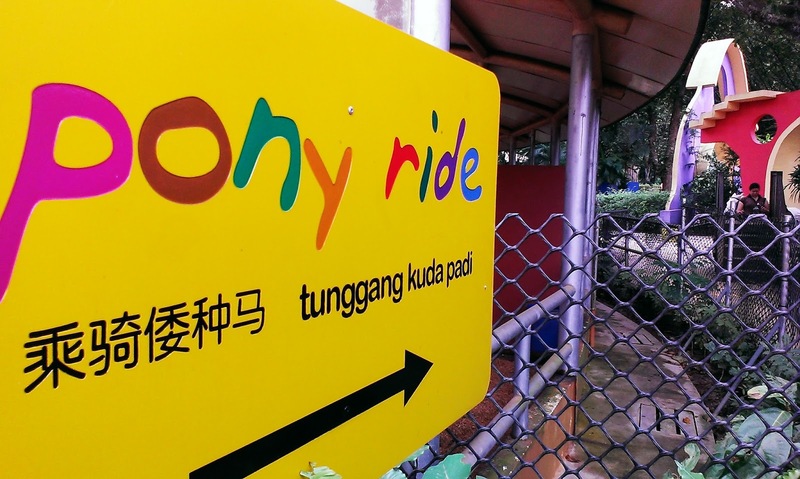 This way to the ride! The return trot with a triumphant look on her face! 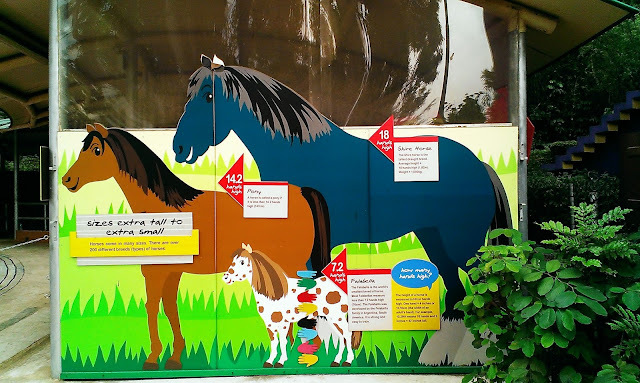 Ever wondered what the differences are betweena pony and a horse? Turns out that the term 'pony' is used for a horse that is below 14.2 hand high from hoof to shoulder. After the ride, we found a spot outside the eateries next to the water themed playground and quickly changed the girls into their swimsuits. Being a weekday, there were plenty of sitting areas for us to choose from, which made it easy for us to pick find a nice strategic spot to settle down. K. immediately requested for her bubble making bottle and A. ran off toward the water to brace herself for next big 'splash down'! Our station right outside the Ben & Jerry's outlet. There's also a KFC next door. "Watch out!!!" Bracing herself for the splash of the day! A. quickly found a friend her size and they stuck together throughout the entire hour and a half we were there. Their favourite activity? Hitting the water slides over and over again. After a quick shower, it was time to head back home. Needless to say, kids were tired out and had a nice nap in the car. We have another zoo trip planned for next month and this time, we hope to cover more of the animal exhibits and the newly opened River Safari. Stay tune.